Summary Extender type three-radio Wi-Fi System with dual-band two-stream AC client and four-stream dedicated 5 GHz backhaul radios Four port Gigabit Ethernet switches on both base and satellite units. Pros • Best performance of any multi-unit / mesh system. Summary 2x2 "mesh" tri-radio router with two 5 GHz and ZigBee radios. 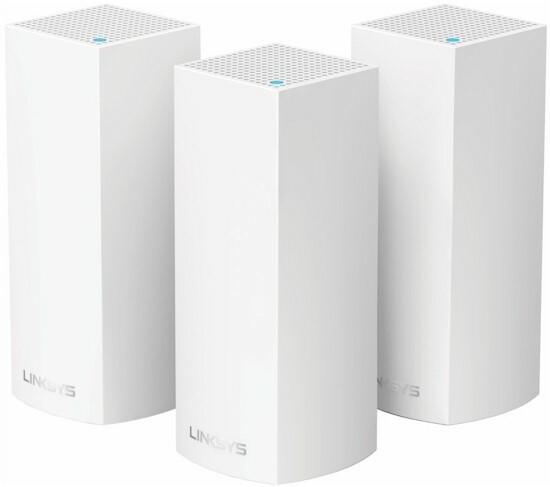 I've been reluctant to award a SmallNetBuilder Top-Ranked award to a Wi-Fi System until I had a chance to retest NETGEAR's original "AC3000" Orbi (RBK50) and Linksys' Velop. I declared Orbi the Wi-Fi System to beat when it was tested almost a year ago now, but was disappointed by Velop when it was tested a few months later. Even with its second 5 GHz radio, Velop's poor backhaul bandwidth made it an also-ran. 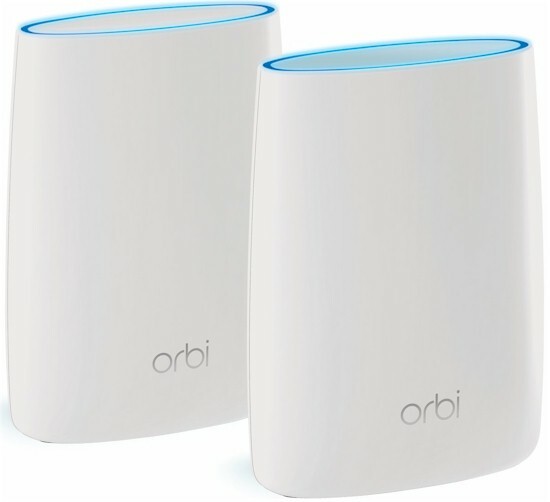 But now that the original Orbi and Velop have both been retested with our new more comprehensive Revision 1 Wi-Fi System process, it's time to formally declare NETGEAR's original "AC3000" Orbi as the winner of our Top Ranked Performance award for Wi-Fi Systems. I'll let the test results speak for themselves. All tests were done with V1.12.0.18 firmware for Orbi and 1.1.2.181801 for Velop. First, a short detour to list Orbi and Velop's innards. The table also includes Orbi mini components, which were not included in the Wi-Fi System Roundup. The Orbi components are for the desktop version; I didn't open up the wall-plugged Orbi mini satellite. The mini is built from essentially the same components as Orbi original. The main changes are a QCA 9886 2x2 5 GHz radio for backhaul and the use of Quorvo QPR4518 5 GHz front ends vs. RFMD 5 GHz power amplifiers. NETGEAR's mini Orbis (RBK30/40) were fine on downlink, but ran about half as fast on uplink. Original Orbi was half again slower than the minis on down, but about the same running uplink. This is in the default configuration and I didn't explore the reasons for the relative slowness. The HTTP test method is better at showing performance differences under load, downloading four different size image files with 2K concurrent connections. The plot below compares mini and original Orbi and Velop. The two Orbis track pretty well. So I'm at a loss to explain the difference on the simpler iperf3 test. ... and big Orbi. I'm glad it's not taller; it just about touched the top of the chamber. The Rate vs. Range or RvR benchmarks look at how throughput varies with decreasing signal. This test is done on the root node, so is a best-case view and does not include any effects from backhaul links. Both Orbi and Velop ran a bit "hot" on 2.4 GHz downlink, exceeding the octoScope Pal reference client's -30 dBm maximum recommended input level. Instead of manually inserting additional attenuation, I shifted both plots by 9 dB. So the first point plotted was actually measured with 9 dB of attenuation set. The 2.4 GHz downlink plot shows both products tracking pretty closely, with a slight advantage for Velop. 2.4 GHz uplink results are also shifted 9 dB and again track pretty closely. ... as are 5 GHz uplink. Neither of these plots are shfited. The upshot of all this is both Orbi and Velop should have similar range for connected clients.